SHENZHEN—A $27 million investment from a Chinese firm will strengthen the efforts of the University of Michigan, along with industry and government partners, to advance autonomous, connected vehicles and robotic technologies for a safer and more sustainable future around the world. Establish a Joint Research Center for Intelligent Vehicles at U-M to support faculty projects on autonomous vehicle technologies. Contribute toward construction of the recently approved Robotics Laboratory and a vehicle garage on U-M’s North Campus that would be located near Mcity, the simulated urban-suburban environment for testing connected and automated vehicles. The garage will create a place for researchers at U-M and its industry partners to work on, maintain and store vehicles. Provide engineering service and consulting fees for U-M researchers to advise Frontt on design of a unique autonomous vehicle test facility in Shenzhen, China. The facility will simulate the country’s unique transportation environment. U-M is already working with companies from a range of industries and countries across the globe, as well as U.S. government at all levels, to address the technical, social, economic, legal, political and business challenges of deploying autonomous and connected vehicles on a large scale. U-M leaders say Frontt’s investment will further strengthen ongoing work in this space. The unique facility in Shenzhen would be developed and used to test new technologies and demonstrate how connected and automated vehicles could improve safety, efficiency, and sustainability in China. China is the world’s most populous nation and one of the largest and fastest growing economies. At the same time, it contributes more greenhouse gas emissions than any other nation. Driverless and connected vehicles could offer transportation modes there that save lives and operate with greater energy efficiency, Hu said. More than 200,000 people die as a result of road accidents in China every year, according to the World Health Organization. Researchers estimate that autonomous and connected vehicles could reduce traffic deaths and injuries by as much as 90 percent. The Chinese facility will simulate the country’s unique transportation environment, which includes different road conditions, traffic density, traffic patterns and culture. Once the facility opens, U-M’s industry partners would have the means to test their autonomous and connected vehicles in an environment that’s distinct from that of the U.S, Hu said. This investment will also help bring to life U-M’s planned 140,000-square-foot Robotics Laboratory, slated to open in winter 2020. In it, robotic technologies for air, sea and roads, for factories, hospitals and homes will have tailored lab space. The building will be situated just down the road from Mcity. “U-M and Michigan Engineering have been leaders in robotic and automotive technologies for decades. Today these fields are rapidly coming together to move society forward and this investment comes at a pivotal time, ” said Professor Alec Gallimore, the Robert J. Vlasic Dean of Engineering. The relationship with Frontt grew out of Gov. Rick Snyder’s effort to strengthen trade relations between Michigan and China. He has made several trade visits to China during his term, and he has welcomed Chinese leaders to Michigan. 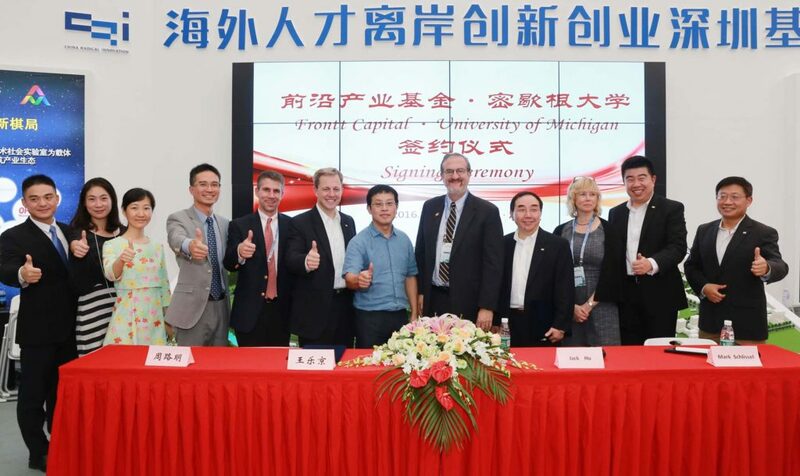 Most recently, in May, Chinese government officials from Guangdong Province and its City of Shenzhen came to Michigan and joined with Snyder to establish the Michigan-Shenzhen Trade, Investment and Innovation Cooperation Center.